One word to describe Tony Ho’s Sad People is original. Produced by The Fauxhemian Collective, this show is made up of actors, writers, filmmakers, comedians, musicians, and dancers. Each night features different guest artists who accompany four actors spearheading this project at the Robert Gill theatre at this year’s Toronto Fringe Festival. Bringing me back to the early days of Saturday Night Live, when comedy sketch was truly far more raw and improvised, Tony Ho’s Sad People definitely pushes boundaries, making this an outrageously memorable Fringe experience. Opening with what seemed like an androgynous host robed in the perfect 1970’s attire, the cast somberly enters the stage and joins the host in a melodic sing-a-long, only to be shooed away moments later. Dark and outlandish, each character, awkward and unique, soon embarks on a tall tale of the most absurd short stories created! I was surprised to hear that each night the four actors bring in a selective group of special guest performers to co-act in the sketches. Partly scripted and partly improvised, this must make things unpredictable and that much more impressive to watch and appreciate. Director Roger Bainbridge and Miguel Rivas along with company J. Adam Brown and Adam Niebergall, are fantastic in their variety of unusual roles. Most unforgettable moments include the “unsung hero” sketch along with the most hilarious scene between a nurse and patient. This show isn’t for everyone, but as a SNL lifetime devotee, I knew it would be my kind of mix. Blending short comedy sketches with hysterical monologues, and an opera sketch to boot, actors take risks, sing and surely entertain. Full of talented performers and amusing scenes, if you are in the mood for absurdity, Tony Ho’s Sad People is the perfect Fringe fix! 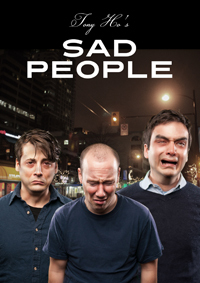 Tony Ho’s Sad People, produced by Fauxhemian Productions is playing at the Robert Gill Theatre at 214 College Street, 3rd floor.